I'm continuing with my planned TBR for TBR Takedown so will be reading the last two books from that list which includes Ugly Love. I've actually already finished it as the other day I found I just couldn't put it down. This was my first experience of Colleen Hoover and although I did find it to be quite a compulsive read I'm not 100% sure about it. I'll go into further detail in my wrap up but I do want to pick up some more Colleen Hoover in the future. This was the last book on my TBR for TBR Takedown and it fitted into the challenge of 'book from your most recent haul.' This book has been on my radar ever since it came out and I bought it from my local supermarket recently. I haven't read any non-fiction in a while and I think Lena Dunham is incredibly intelligent, thoughtful and hilarious so I'm looking forward to getting into this. This is my TBR jar pick for this month and I'm super excited about it! It's one of Rainbow Rowell's adult contemporaries and follows office worker Beth and the office's 'internet security officer' Lincoln, whose job it is to read everyone's emails. Beth and her co-worker Jennifer are constantly exchanging emails detailing their personal lives and Lincoln knows he should report this but finds himself compelled by their conversations and slowly finds himself falling for Beth. It sounds like it's going to be really sweet and funny and anything by Rainbow Rowell gets a big tick from me. This is the second book in the Midnighters trilogy, the first of which I read last month and really enjoyed so I'm eager to carry on with the series. It's quite difficult to explain the concept of these books but they basically revolve around a secret hour which happens every midnight, where the world freezes in a single moment for everyone except for a chosen few who use this silent hour to explore their powers. It's really interesting and I'm really looking forward to carrying on with the series. This is my classic pick for the month and after two months of Jane Austen I think it'll be nice to change things up a bit with some children's literature. I loved the film of this book when I was younger and I'm really excited to see how the book compares. The Secret Garden follows Mary, a spoiled orphan who is sent to live with relatives at Misselthwaite Manor. She is determined to hate it there until she discovers a secret garden which has been locked up since the death of her aunt ten years earlier. I have a feeling that the book will be even more beautiful and mysterious than the film and I'm looking forward to exploring it's world. If I have time towards the end of the month, I'd like to continue with my Harry Potter re-read. Half Blood Prince was initially my favourite book and I'd like to see if I still feel the same. There isn't really much to say about this except that I'm obviously going to love it and I'm looking forward to getting back into the world I love so much. Also it was recently J.K. Rowling's 50th birthday and the wonderful Jim from YA Yeah Yeah asked 50 people to share their favourite moments from the series and I was one of the lucky people to be involved. You can read the post here! 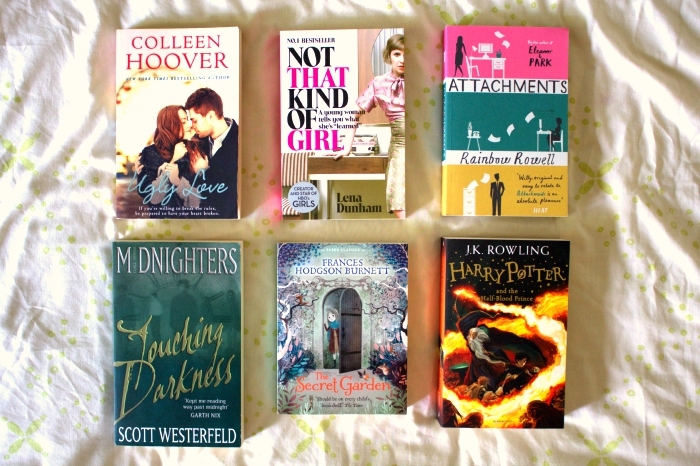 So those are the books I'll be probably be reading this month. If you're reading this I hope you have a wonderful August and happy reading!